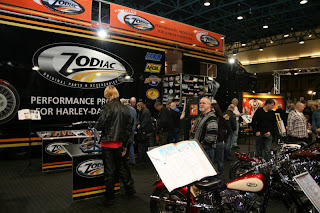 Zodiac International has become the latest European Distributor and parts designer/manufacturer to sign-up to exhibit at the all-new Big Bike Europe expo at Essen in Germany in May 2013. Established in Europe in 1984 by Ton Pels, Zodiac distributes to over 50 countries worldwide from its 5,000 sq m (50,000 sq ft) distribution centre at Mijdrecht in The Netherlands. The company’s multi-lingual sales team includes country managers in UK, Germany, France, Italy, Spain and Hungary, with their 1,400 page plus annual ‘Biker’s Book’ parts and accessories catalogue produced in five languages. At any one time at least 30,000 different products are carried in inventory by Zodiac, from hundreds of vendors worldwide, including many of the best selling Harley-Davidson aftermarket and custom v-twin performance, tuning and custom product lines from the United States. Commenting on the decision to take part in Big Bike Europe Ton Pels said that “we have an established track record of backing interesting expo projects around Europe, projects that allow us to get closer to our international dealers and their customers. “However Big Bike Europe breaks new ground – we like the fact that it will be a non-retail expo focussed 100 percent on how motorcycles look, handle and perform. On an international basis we think that this is a valuable new approach for the market in changed times”. Big Bike Europe is being described by AMD Magazine owner Robin Bradley as an “international headquarters expo for the parts, accessories, custom, performance, tuning, service and workshop market in Europe” and will be staged in a self-contained 10,000 sq m (100,000 sq ft) state-of-the art three-hall expo complex at the Essen Expo Centre in central Germany. One of Europe’s leading exhibition venues, Essen lies at the heart of Europe’s large displacement rider community. According to research conducted by respected European motorcycle industry trade journal International Dealer News at least two-thirds of Europe’s 500 cc plus riders and the dealers they buy from, including Harley-Davidsons and Harley dealerships, are said to be within a three hour ride of Essen. With some 18m consumers within a 100km radius, the Essen area itself is said to boast among the highest levels of large displacement motorcycle ownership per head of population of anywhere in the world. Essen has excellent road and rail links to the rest of Europe, is served by regular shuttle buses from Düsseldorf airport (25 km away), and offers exhibitors and show visitors access to a wide range and large number of accommodation options at price points to suit all budgets. Big Bike Europe will be the new host event for the AMD World Championship of Custom Bike Building and the International Motorcycle Industry Conference, with a three day formula that sees invited Trade/Dealer and VIP Visitor only attendance on Friday May 10th. Dealers will be invited to attend by exhibitors, in conjunction with AMD Magazine and International Dealer News, and once registered will have access to a package of VIP Visitor privileges for their best customers to attend the show for all three days on a VIP Visitor ‘shop-ride-scheme’ basis. Big Bike Europe will be open to general rider, enthusiast and public admission on Saturday May 11th and Sunday May 12th, with a range of discounted advance ticket purchase options available online later this year.